The Green Bay Packers had a 3-1-1 record and were trying to maintain pace with the Bears in the NFL Western Division as they took on the Giants in New York on October 31, 1943. Head Coach Curly Lambeau’s team was missing a couple of key players in rookie tailback Irv Comp, who was out with a leg injury, and center Charley Brock, due to a recent bout with appendicitis. 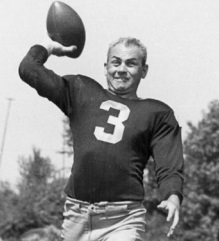 But other key players, notably tailback Tony Canadeo and end Don Hutson (pictured above), were present. The Giants, coached by Steve Owen, were 2-1. Rookie FB Bill Paschal was a key addition to the club that already had a solid runner in wingback Ward Cuff. The aging but still able QB Tuffy Leemans and C/LB Mel Hein were also on a roster depleted by wartime. Moreover, the Packers had beaten the Giants only once since 1936, a total of six meetings with two of them having NFL titles on the line. There were 46,208 fans in attendance at the Polo Grounds. On their second possession of the game, following an exchange of punts, the Packers started off at their own 27. Tony Canadeo threw to Don Hutson for six yards and then ran the ball himself for 12. Another throw to Hutson advanced the ball to the New York 41 and, following a short run by FB Tony Falkenstein, Hutson took the handoff on an end-around and caught the Giants by surprise as he threw an option pass down the middle to end Harry Jacunski for a 38-yard touchdown. Hutson added the extra point for the 7-0 lead. Following the failure of the Packers to convert a fourth-and-one play on their next series, the Giants took possession at their 43. Tuffy Leemans ran for 14 yards and Ward Cuff for another 14. Cuff caught a pass from Leemans for 12 yards to the Green Bay 17 but the drive stalled at that point as a run was held to no gain and two passes were incomplete. On fourth down, Leemans dropped back and, evading several defenders, threw to Bill Paschal who was alone in the end zone for an 18-yard TD. Cuff’s conversion tied the score at 7-7. On the last play of the opening period, HB Lou Brock returned the kickoff to the Green Bay 28. Canadeo (pictured at right) and HB Andy Uram had good runs to get the ball into New York territory and, after Brock ran for five yards, Canadeo connected with Hutson for 14 yards and Jacunski for 13. Uram finished the series off with a 12-yard touchdown pass to Canadeo, Hutson added the point after, and the visitors were ahead by 14-7. Green Bay scored again on its next possession. A Canadeo pass to Hutson gained 19 yards to the New York 21 and, after the tailback ran for four yards, he threw to Hutson again for a 17-yard TD. Hutson added the PAT and the Packers took a 21-7 margin into halftime. The Giants moved well on offense to start the third quarter, but a promising drive came up empty at the Green Bay 14 when the home team was forced to give the ball up on downs. The Packers had to punt and New York advanced 58 yards and did not come away empty handed. QB Emery Nix threw to Paschal for a gain to the Green Bay 18 and Paschal then carried the ball for another 12 yards. Two plays later, it was Paschal powering through the line for a four-yard touchdown. Cuff converted to make it a seven-point game at 21-14. On their next series, the Giants again moved effectively, putting together a 65-yard drive. With first-and-goal at the six, however, the Packers held on defense for three plays and Paschal, catching a pass on fourth down, was tackled just a foot short of the goal line. The game now headed into the fourth quarter and the Packers had to punt again, Paschal returning it 17 yards to the Green Bay 28. Nix completed a pass to back Leland Shaffer to the 19 and Paschal ran for seven yards. It was Paschal (pictured below) again finishing off the drive with a dive into the end zone from a yard out. Cuff capped the home team’s comeback with the extra point that tied the score at 21-21. The Packers reached the New York 36 on their next series but came up empty when Chet Adams was short on a 45-yard field goal attempt. On their next possession, Canadeo connected with Brock for a 40-yard gain but followed up with a pass that was intercepted. The Giants were now stymied on offense and punted. This time the visitors didn’t fail to score, advancing 66 yards in three plays. Uram faded back and threw long to Jacunski, who caught the ball over his shoulder for a gain of 48 yards to the New York 15. Two plays later, Canadeo fired a pass to Hutson for a 12-yard TD. Hutson added the point after and Green Bay was back in front by 28-21 with four minutes remaining to play. The Packers got the ball back two minutes later at the New York 40 following Paschal’s punt for the Giants. Canadeo ran for five yards and then broke away on a game-clinching 35-yard touchdown run. Hutson converted and Green Bay came away with a 35-21 win. The Packers had a big lead in total yards (429 to 288) although the Giants had the edge in first downs (16 to 15). Green Bay both out-rushed (158 to 114) and out-passed (271 to 174) New York, but they also suffered the game’s only turnover. Tony Canadeo rushed for 122 yards on 18 carries and one touchdown in addition to throwing for two TDs. 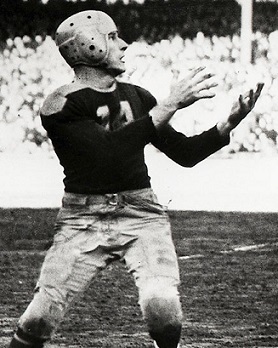 Don Hutson caught 8 passes for 103 yards and two TDs, passed for a touchdown (the only one of his Hall of Fame career), and with his placekicking added in accounted for a total of 17 points. Harry Jacunski had 5 catches for 124 yards and a touchdown. Green Bay lost to the Bears the following week and, while they won their remaining games, it was enough to ensure that they would finish in second place in the Western Division with a 7-2-1 record. The Giants tied the Lions in their next game, were thoroughly overwhelmed by the Bears, but then won four straight to close out the schedule and salvage a tie for first place in the Eastern Division with Washington at 6-3-1. They lost the ensuing playoff with the Redskins. Don Hutson caught 47 passes for 776 yards and 11 touchdowns, all NFL-leading totals. Already the NFL’s career scoring leader, he led the circuit with 117 points. He was a consensus first-team All-NFL selection along with Tony Canadeo, who passed for 875 yards and 9 TDs and rushed for 489 yards and three scores. 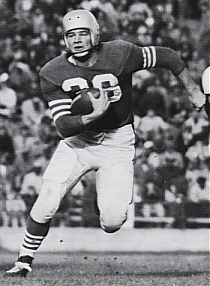 Bill Paschal was the league’s rushing leader, by a yard over Phil/Pitt’s Jack Hinkle, with 572 yards. He scored a NFL-high 10 TDs on the ground and tied Hutson with 12 touchdowns overall. Bell had an injury-riddled college career but still was chosen by the Buffalo Bills in the first round (26th overall) of the 1984 NFL draft. He made an impact as a rookie, rushing for 1100 yards, including 206 in an upset of the Cowboys, and catching 34 passes, and was selected to the Pro Bowl. Bell followed up with another productive season in 1985, gaining 883 yards on the ground and catching 58 passes for another 576 yards and a total of 1459 yards from scrimmage. However, injuries limited him to six games and 377 rushing yards in ’86 and Bell was dealt to the Rams as part of the three-team trade that sent RB Eric Dickerson to the Colts during the strike-interrupted 1987 season. He saw little action while RB Charles White had a big year in Dickerson’s place, but with White missing time in 1988, Bell moved to the forefront. Rams went 10-6 to finish second in the NFC West and qualified for a Wild Card playoff slot while leading the conference in scoring (407 points). Lost NFC Wild Card playoff to Minnesota Vikings (28-17). 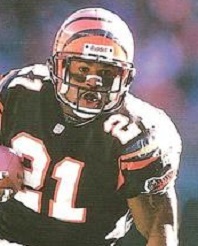 Bell followed up by rushing for 1137 yards in 1989 and again leading the league in rushing touchdowns with 15. But he did not get along well with teammates or the front office and, when he threatened to hold out in ’90, he was traded to the Raiders. Bell appeared in just six games due to an ankle injury and rushed for 164 yards in what ended up being his last active season. He was released the following preseason and retired after being let go by Green Bay prior to the 1992 season. Overall, Bell rushed for 4959 yards on 1204 carries (4.1 avg.) and caught 157 passes for 1307 yards (8.3 avg. ), scoring a total of 58 touchdowns. 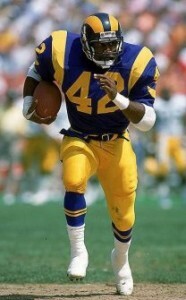 Of those totals, 2375 rushing yards and 31 TDs, came with the Rams. He was chosen to one Pro Bowl. The Cleveland Browns were struggling as they traveled to Cincinnati to play their intrastate rivals, the Bengals, on October 29, 1995. Head Coach Bill Belichick’s team was underachieving. They had reached the playoffs in ’94 but were coming into Cincinnati at 3-4 after sustaining three consecutive defeats. WR Andre Rison was brought in as a free agent and had failed to provide the anticipated impact and the running game was not up to par. The Browns looked especially lackluster against the expansion Jaguars the previous week and Coach Belichick chose to bench veteran QB Vinny Testaverde in favor of rookie QB Eric Zeier (pictured above). The Bengals were in their fourth year under Head Coach David Shula, and that included back-to-back 3-13 records in 1993 and ’94. They were also 3-4 thus far, having won their first two games before dropping four straight and then defeating Pittsburgh in their most recent contest. There was talent on offense with QB Jeff Blake, TE Tony McGee, and wide receivers Darney Scott and Carl Pickens. But the defense was deficient, especially against the pass. There were 58,639 fans in attendance at Riverfront Stadium. The Bengals had the first possession and advanced 85 yards in seven plays, helped along by a 46-yard pass interference call on CB Antonio Langham. 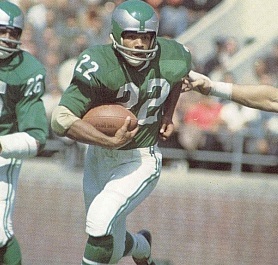 RB Harold Green ran for 16 yards on first down and Jeff Blake completed four passes, the last of which was to Green from a yard out for a touchdown. However, a bad snap forced Cincinnati to abort the extra point attempt and the pass attempt from the holder, punter Lee Johnson, fell incomplete. The Browns responded by driving 33 yards in 11 plays. Eric Zeier completed two passes that converted third downs, but an apparent completion to TE Brian Kinchen for 20 yards on a third-and-nine play from the Cincinnati 25 was flagged for offensive pass interference and Cleveland ultimately had to settle for a 44-yard Matt Stover field goal that narrowed the score to 6-3. The Bengals punted following their next series and, in a possession that extended into the second quarter, Cleveland advanced 65 yards in 12 plays. The biggest was a Zeier throw to RB Earnest Byner for 22 yards in a third-and-seven situation, but with first-and-goal from the Cincinnati six, the visitors were unable to advance farther and Stover tied the score with a 25-yard field goal. Cincinnati moved effectively on the next possession as Green carried twice for 19 yards and Blake completed passes to Tony McGee for nine yards and RB Eric Bieniemy for 19. A roughing-the-passer penalty got the Bengals to the Cleveland 23, but Green, who was injured on the play, fumbled and DT Tim Goad recovered for the Browns. 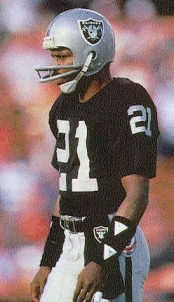 Zeier immediately threw to Andre Rison (pictured below) for 23 yards but the series ended at the Cleveland 39 when RB Leroy Hoard lost a yard on a fourth-and-one play. The teams traded turnovers before the Bengals, taking over with 4:48 left in the first half, put together a drive of 66 yards in nine plays. Facing third-and-ten, Blake connected with Darnay Scott for 18 yards and then followed up with another 18-yard completion, this time to McGee. Another completion, to WR David Dunn, gained 15 yards and an unnecessary roughness penalty on the Browns added another 15 to the Cleveland 19. The drive stalled, but Doug Pelfrey booted a 37-yard field goal that moved Cincinnati back in front by 9-6. With the clock now down to 1:08, the Browns moved down the field with Zeier completing four passes, the longest to Rison for 46 yards. Stover kicked a 36-yard field goal and, when Pelfrey’s last-ditch try for a 63-yard field goal fell short, the score was 9-9 at the half. The Browns had the ball first in the third quarter and broke the tie with an 11-play, 55-yard drive. 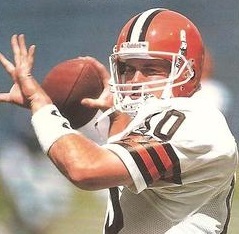 Zeier completed five passes, the longest for 17 yards to Byner to reach the Cincinnati 20, but again the advance stalled and Stover came on to kick his fourth field goal, from 38 yards, to make it a 12-9 game. The Bengals came back with an 80-yard possession that used eight plays. Green ran effectively and Blake completed passes to Scott for 31 yards and Bieniemy for 32. Facing third-and-goal, Blake completed an eight-yard touchdown pass to Carl Pickens and, with Pelfrey’s point after, the home team led by 16-12. Zeier threw to Rison for a 59-yard gain to the Cincinnati five on the first play following the kickoff, but he was sacked and his next pass was intercepted by LB Steve Tovar. The Bengals had to punt, with Lee Johnson’s kick traveling only 27 yards to give the Browns good starting field position at their own 48. It came to naught as, with the game now into the fourth quarter, Cleveland was pushed back by penalties and had to punt in turn. Following another punt by the Bengals, the Browns put together a 90-yard series in six plays. Zeier completed two passes before running for a 22-yard gain to the Cincinnati 37. After a pass interference call picked up another 20 yards, Zeier threw high to a leaping Rison for a 17-yard TD. Stover’s kick put the Browns in the lead by 19-16. Cincinnati went three-and-out and punted and the Browns had to punt as well. However, the visitors got a break when Tom Tupa’s 64-yard kick was muffed by CB Corey Sawyer and CB Johnny Thomas recovered for Cleveland at the Bengals’ five. Two plays later, Byner ran for a three-yard touchdown. Stover kicked the extra point and, with less than three minutes remaining in regulation, the Browns were ahead by 26-16. The Bengals needed to score quickly and Blake passed for 10 yards to RB James Joseph but suffered a slight concussion when sacked on the next play. Backup QB David Klingler, who was just coming back from being sidelined with a broken jaw, came into the game and threw to Bieniemy for 33 yards. Following the two-minute warning, Klingler threw an incomplete pass and was then sacked, but facing third-and-20 he hit McGee for a gain of 21 yards. Pelfrey kicked a 41-yard field goal and it was a seven-point game with 1:09 on the clock. The Bengals executed a successful onside kick and were back on offense at the Cleveland 37. Klingler threw to Dunn for 17 yards but, after two more passes fell incomplete, consecutive pass interference penalties on Langham moved the ball to the one yard line. From there, Klingler threw to Pickens for a touchdown and Pelfrey’s extra point sent the contest into overtime tied at 26-26. The Browns had the first possession in the extra period and punted. Cincinnati, with Blake again behind center, also had a short series and punted. Following another Cleveland punt, the Bengals had the ball at their own 38 and Blake went to the air. DB Dana Hall intercepted the tipped ball and the Browns were back on offense at the Cincinnati 45. Zeier threw to FB Tommy Vardell for seven yards and the fullback then rushed for six more. 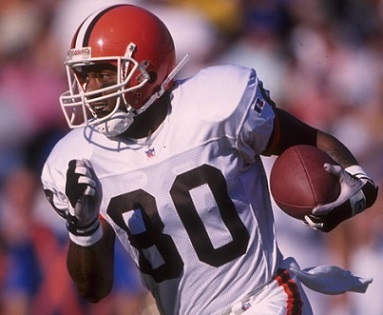 Following an incomplete pass, Byner ran around end for a 23-yard gain to the nine and, two plays later, Stover kicked a 28-yard field goal to give the Browns a 29-26 win. Cleveland led in total yards (480 to 384) although the Bengals had the edge in first downs (27 to 26). The Browns also had five sacks, to two by Cincinnati, while the Bengals turned the ball over four times, to two suffered by Cleveland. Both teams were heavily penalized, with the Browns drawing 15 flags, at a cost of 188 yards, to 10 thrown on Cincinnati. Eric Zeier completed 26 of 46 passes for 310 yards and a touchdown while giving up one interception and also rushed for 44 yards on 8 carries. Andre Rison had his most productive game with Cleveland, catching 7 passes for 173 yards and a TD. Earnest Byner ran for 74 yards on 17 attempts that included a score and also had four pass receptions for 43 yards. Matt Stover made good on all five his field goal attempts. For the Bengals, Jeff Blake was successful on 20 of 35 throws for 249 yards and two TDs while also giving up two interceptions. In relief, David Klingler went five-of-11 for 73 yards and a touchdown. Eric Bieniemy (pictured at left) caught 6 passes for 95 yards while adding 19 yards on four rushing attempts. Harold Green topped the club with 66 yards on 14 carries and scored a TD on one of his four pass receptions for 23 yards. The good showing by Eric Zeier in his first career start was not followed by comparable outings and Vinny Testaverde regained the starting job later in the season. By then, owner Art Modell had let it be known that the Browns would be moving to Baltimore in 1996, and the team completely collapsed down the stretch to finish at 5-11 and in fourth place in the AFC Central. They swept the season series with Cincinnati, but the Bengals still managed to finish ahead of them in second at 7-9. Zeier completed 82 of 161 passes for 864 yards and four touchdowns while giving up nine interceptions overall in 1995. He moved with the franchise to Baltimore and spent another three years with the rechristened Ravens, having only middling success when again given the opportunity to start. Andre Rison ended up with 47 catches for 701 yards (14.9 avg.) and three touchdowns, which was well below expectations, and he didn’t remain with the relocated club. He spent the ’96 season with Jacksonville and Green Bay before briefly rejuvenating his career with the Chiefs in 1997. The first overall pick by the Steelers in 1970, Bradshaw took time to develop. In 1974, his fifth season, he lost his starting job early to Joe Gilliam but reclaimed it and led Pittsburgh to the first NFL Championship in franchise history. Unchallenged as the starting quarterback, he was selected to the Pro Bowl for the first time in 1975 as the Steelers won a second straight Super Bowl. Following an injury-plagued 1976 season, he came back in ’77 to achieve a new high with 2523 passing yards while leading the NFL with 8.0 yards per attempt and in 1978 he received MVP and consensus first-team All-NFL honors as he led the league in TD passes (28) and yards per attempt (7.9) and the AFC in passing (84.7 rating), and the Steelers won another Super Bowl. Bradshaw had another Pro Bowl season in 1979, throwing for a career-high 3724 yards and leading the Steelers to a fourth NFL title. 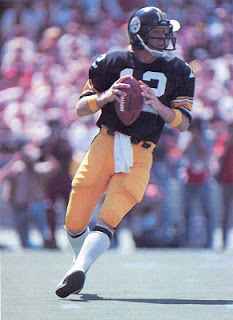 While there were no more championships, Bradshaw played well for a team showing its age in 1980, passing for 3339 yards and 24 touchdowns, and he threw for 2887 yards and 22 TDs in 1981. Steelers went 6-3 in the strike-shortened season and were fourth seed in the AFC playoff tournament that replaced the usual postseason format. Lost First Round playoff to San Diego Chargers (31-28). The 1982 season proved to effectively be Bradshaw’s last as a severe elbow injury limited him to the season finale in 1983, and he was forced to retire. For his career, he passed for 27,989 yards and 212 TDs, but most significantly had a 107-51 record as a starting quarterback (as well as 14-5 in the postseason, 4-0 in the Super Bowl). 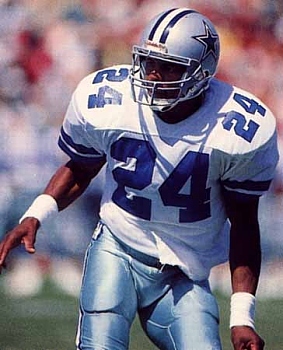 Bradshaw was a consensus first-team All-NFL selection once, received second-team All-NFL or All-AFC honors after two other years, and was selected to the Pro Bowl three times. He was inducted into the Pro Football Hall of Fame, Class of 1989. The Atlanta Falcons, with a 3-3 record, traveled to New Orleans to take on their rivals, the Saints, on October 27, 2002. Coached by Dan Reeves, the Falcons featured flashy second-year QB Michael Vick directing the offense. RB Warrick Dunn (pictured at right), formerly of the Buccaneers, was off to a slow start but WR Brian Finneran was having a breakout year. Moreover, after getting off to a 1-3 start, the team was coming off of two wins, including a 30-0 thrashing of the Panthers the previous week. The Saints were coached by Jim Haslett and had started off impressively at 6-1. The offense was especially productive with QB Aaron Brooks, who also happened to be Vick’s cousin, behind center. 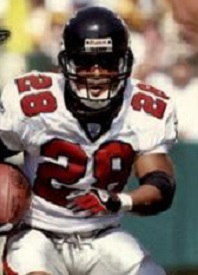 RB Deuce McAllister was an outstanding runner and the receiving corps, led by WR Joe Horn, was a good one. There were 67,883 fans in attendance at the Louisiana Superdome. Following a punt by the Falcons, the Saints had the ball at the Atlanta 43 to begin their first series and, with Aaron Brooks running for 19 yards and Deuce McAllister picking up another 15 on two carries, they scored first on a 40-yard John Carney field goal. Once again the Falcons were forced to punt, thanks to back-to-back sacks, and New Orleans advanced 65 yards in nine plays. McAllister started the series off with a 28-yard run to the Atlanta 37 and a roughing-the-passer penalty on a third down play kept the drive alive. McAllister finished it off with a one-yard touchdown carry and Carney added the extra point to extend the home team’s lead to 10-0. The Falcons were helped along on their next possession by a 32-yard pass interference penalty in a second-and-14 situation and, on the first play of the second quarter, Vick ran for 27 yards to the New Orleans 24 on a second-and-25 play. Three carries by Warrick Dunn picked up 18 yards and, after another defensive penalty, Vick gained the last three yards for a TD. Jay Feely’s point after narrowed the score to 10-7. The Saints responded with a drive that featured completions by Brooks to Joe Horn for 16 and 25 yards, but McAllister fumbled at the end of a nine-yard run and LB Sam Rogers recovered at the Atlanta 30. Vick completed a pass to TE Alge Crumpler for 33 yards and, following two runs by Dunn that picked up nine yards, converted on third-and-one with a two yard carry. Two plays later, Vick connected with WR Willie Jackson for 18 yards and on the next play Dunn ran for a three-yard touchdown. Feely converted and the visitors were ahead by 14-10. Atlanta got the ball back when LB Chris Draft intercepted a Brooks pass at midfield and returned it nine yards, but after reaching the New Orleans 17, Dunn fumbled after making a catch and the Saints recovered at their five. The score remained unchanged at halftime. The Saints had the ball first in the third quarter but a Brooks throw was picked off by FS Keion Carpenter to give the Falcons excellent field position at the New Orleans 31. This time they did not fail to cash in as Vick (pictured at left) threw to Brian Finneran for 28 yards and FB Bob Christian ran for an eight-yard touchdown. Feely’s point after put the visitors ahead by 11 points at 21-10. WR Michael Lewis returned the ensuing kickoff 41 yards and the Saints moved quickly to score. McAllister ran for six yards after which Brooks threw to Horn for 17 and had another 15 yards tacked on thanks to an unnecessary roughness penalty. Brooks threw to McAllister for a 19-yard TD and then to TE Boo Williams for a two-point conversion and the Atlanta lead was trimmed to 21-18. CB Allen Rossum gave the Falcons a good kickoff return of 41 yards and Vick threw four straight passes, three of them complete. The third, to Finneran, was good for 14 yards to convert a third-and-seven situation and runs by Dunn and Christian got the ball to the New Orleans 13. Feely kicked a 31-yard field goal and the visitors were up by 24-18. Lewis responded with a 65-yard kickoff return to the Atlanta 38 and Brooks immediately threw to McAllister for a 16-yard gain. Three more running plays set up a Brooks completion to Horn for a six-yard touchdown and, with Carney adding the extra point, the Saints were on top by 25-24. The Falcons had the ball as the game headed into the fourth quarter. Dunn had a 56-yard run to the New Orleans 18 and, while the visitors couldn’t reach the end zone, Feely booted a 32-yard field goal to re-take the lead at 27-25. The Saints punted on their next series and Atlanta used 10 plays to drive 92 yards. Dunn started things off with an 18-yard run and Vick had a 10-yard carry on a third-and-nine play. A roughing-the-passer call moved the Falcons past midfield and Vick completed a pass to Finneran for 10 yards. It was the nimble quarterback running the final 32 yards for a touchdown and, adding Feely’s PAT, Atlanta was now ahead by 34-25 with 5:57 remaining in regulation. New Orleans fought back with a series that nearly ended with an apparent interception that was overturned on replay review. With that reprieve, Brooks threw to WR Jake Reed for 15 yards and to McAllister for 15, but an offensive pass interference penalty blunted the drive and Carney kicked a 40-yard field goal to at least narrow the score to 34-28 with the clock now down to 3:38. Disaster struck for the Falcons on their next play from scrimmage when Dunn fumbled when hit by FS Jay Bellamy at the end of an eight-yard run and CB Fred Thomas recovered at the Atlanta 28. Carries by McAllister and Brooks gained six yards apiece and, following an incomplete pass, McAllister ran off tackle for a 16-yard TD. Carney’s extra point again put the home team back on top by 35-34. There was 2:12 to play as the Falcons started their next series at their own 11 after an offensive holding penalty on the kickoff return moved them back. Vick fired off passes to TE Brian Kozlowski for 11 yards, Dunn for 12, and Crumpler for five yards to reach the 39. Vick took off on an eight-yard run, threw to WR Shawn Jefferson for 14 yards, and ran for six yards to the New Orleans 33. A defensive holding penalty added four more yards but the Falcons could advance no further as a run by Dunn gained nothing and a pass was incomplete. Finally, Feely came on to kick a 47-yard field goal on the game’s last play and Atlanta won in dramatic fashion by a final score of 37-35. The Falcons had the edge in total yards (446 to 351) and first downs (28 to 22). They gained 260 of their yards on the ground, to 159 for New Orleans. The Saints turned the ball over three times, to two suffered by Atlanta, and both clubs were heavily penalized, with the Falcons getting flagged 10 times at a cost of 95 yards and New Orleans 9 times for 96 yards. The teams combined for just three punts, two by Atlanta. 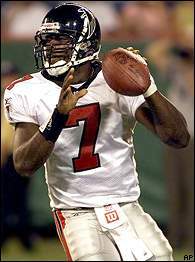 Michael Vick, who became ill on the climactic drive and had to remove himself from the game, completed 16 of 24 passes for 195 yards and, while there were no touchdowns he also gave up no interceptions. Vick also rushed for 91 yards on 10 carries and scored two TDs. Warrick Dunn gained 142 yards on 23 rushing attempts that included a touchdown and also caught five passes for 28 more yards. Alge Crumpler and Brian Finneran each gained 62 receiving yards on an identical four pass receptions. For the Saints, Aaron Brooks was successful on 16 of 35 throws for 192 yards and two TDs while giving up two interceptions. 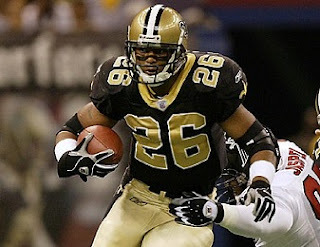 Deuce McAllister (pictured above) ran for 115 yards and two touchdowns on 17 carries and had five catches for 56 yards and another TD. Joe Horn also had five receptions, for a team-leading 61 yards and a score. Michael Lewis averaged 33.5 yards on six kickoff returns. The Falcons followed up on their dramatic win by going 4-0-1 over the next five weeks, which included another victory over New Orleans at home, and while they lost three of their last four games, they finished at 9-6-1 to place second in the NFC South and secure a Wild Card playoff spot. Atlanta stunned the Packers in Green Bay in the first round before falling to the Eagles at the Divisional level. The Saints won the following week but only twice more after that as they faltered down the stretch. They ended up third in the division with a 9-7 record and out of the postseason. The Dallas Cowboys were at 5-2 and seeking to keep pace in the NFC East as they hosted the Miami Dolphins on October 25, 1981. Under the direction of Head Coach Tom Landry, the Cowboys were perennial contenders that had reached the NFC Championship game the previous year, and even amidst retooling remained a powerful team. 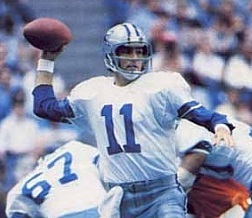 QB Danny White (pictured above) was an able passer with a fine stable of receivers and RB Tony Dorsett an outstanding ground gainer. The defensive backfield had been a question mark early on but was benefiting from the play of cornerbacks Everson Walls, an undrafted rookie, and Dennis Thurman, formerly a safety, as well as first-year FS Michael Downs. Miami, coached by Don Shula, came into the game at 5-1-1. Second-year QB David Woodley directed the talented offense that contained RB Tony Nathan, a productive all-purpose back, and a fine group of receivers led by WR Duriel Harris. The defense was strongest up front. There were 64,221 fans in attendance at Texas Stadium. The Dolphins had the game’s first possession and punted. Tony Dorsett ran for 16 yards on first down, but two plays later he fumbled after gaining 19 yards on a screen pass from Danny White and CB Gerald Small recovered for Miami. It took just three plays for the Cowboys to regain possession thanks to an interception by Everson Walls, giving them the ball at the Dallas 38. White threw to WR Butch Johnson for 25 yards, Dorsett ran for 11 more on a second-and-seven play, and White connected with TE Jay Saldi for another 13 yards. FB Ron Springs plowed into the end zone from five yards out and Rafael Septien added the extra point. In response, the Dolphins methodically advanced to the Dallas 30, but a run by Tony Nathan to try and convert a fourth-and-inches situation was stopped short by LB Bob Breunig. In the second quarter, and following an exchange of punts, Miami put together an 87-yard drive in eight plays. Woodley (pictured at left) completed passes to WR Jimmy Cefalo for 31 yards and Duriel Harris for 30 and his five-yard toss to Nathan was good for a TD. However, the extra point attempt failed when Uwe van Schamann, who had been successful on 70 straight, hit the right upright. The Cowboys maintained a 7-6 lead. The Cowboys drove 80 yards in ten plays to another score with Dorsett carrying for 12, 9, and 18 yards and White throwing to WR Drew Pearson for a gain of 23 yards to the Miami 25 in a second-and-24 situation following a sack. Three plays later, and after converting a fourth down, Johnson got beyond CB Gerald Small and caught a pass from White for a 21-yard touchdown. Septien converted to make the score 14-6 with 55 seconds left in the first half, and that remained the tally at halftime. Early in the third quarter, following a punt by the Cowboys, David Woodley threw long to Cefalo who went 69 yards for a touchdown. Van Schamann added the point after this time and the visitors were again behind by a point at 14-13. The teams exchanged punts for the remainder of the period. 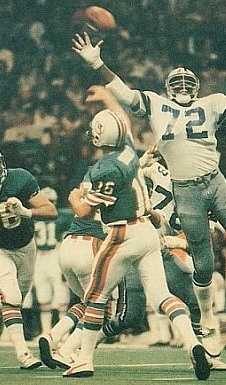 As the game headed into the fourth quarter, the Dolphins were in Dallas territory and threatening, but Woodley threw a pass that was intercepted by Dennis Thurman. The Cowboys lost 13 yards in three plays, however, and White punted to give the Dolphins possession at the Dallas 42. Woodley passed to Cefalo for 32 yards to set up a 10-yard throw to Nathan for a TD. Van Schamann converted and the Dolphins were in front by 20-14. Passes by White to WR Tony Hill that gained 21 and 24 yards had Dallas in Miami territory, but an interception by LB Earnest Rhone appeared to sink the Cowboys when, eight plays later and after Woodley threw to Harris for a 45-yard gain, he rolled out and tossed a four-yard touchdown pass to TE Joe Rose. Van Schamann’s kick extended the visitors’ lead to 27-14 with 5:16 remaining in regulation. Dallas responded with a five-play, 79-yard drive. White threw to Hill for a pickup of 38 yards and, with 3:48 remaining to play, he connected with TE Doug Cosbie for a five-yard touchdown. Septien’s point after made it a six-point game at 27-21. No sooner had the Dolphins gone back on offense when, with Coach Shula choosing to go to the air rather than keeping the ball on the ground, Woodley threw a pass that was intercepted by Thurman, who returned it 12 yards. White immediately threw to Springs, who had beaten LB Bob Brudzinski, for a 32-yard TD. Septien added the all-important PAT and the second scoring pass in 31 seconds moved the Cowboys in front by a single point. The Dolphins weren’t out of it yet and they drove deep into Dallas territory, the big play a Woodley throw to Harris for 41 yards to the Dallas 28, but two plays later, with the clock now down to 58 seconds, Walls (pictured below) intercepted a Woodley pass at the four yard line. The Cowboys ran three plays and, coming up a yard short of a first down, were forced to punt from their 31. Woodley threw to Rose for 12 yards but, in the final seconds, Michael Downs intercepted a pass at the Dallas 42 to finally secure the 28-27 win for the Cowboys. The teams combined for 1006 yards, with Miami having the most (529 to 466) and also the edge in first downs (25 to 23). However, the Dolphins also turned the ball over five times, to two by Dallas. The Cowboys were credited with three sacks, to two by Miami. Ultimately, the contest came down to the missed extra point in the first half. Danny White completed 22 of 32 passes for 354 yards and three touchdowns, two of them leading Dallas from behind in the final minutes, and gave up one interception. Tony Dorsett rushed for 122 yards on 24 carries and caught three passes for 31 more yards. Ron Springs had 6 pass receptions for 93 yards and a TD and Tony Hill gained 106 yards on his five catches. Butch Johnson contributed three receptions for 68 yards and a score. On defense, Dennis Thurman and Everson Walls accounted for two interceptions apiece that proved critical. 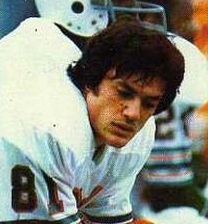 For the Dolphins, David Woodley was successful on 21 of 37 throws for a then-team-record 408 yards and three TDs, although he gave up five interceptions. Four of the pickoffs came in the fourth quarter and three in the last four minutes of play. Duriel Harris caught 6 passes for 165 yards and Jimmy Cefalo (pictured at right) gained 164 yards on five receptions that included the long touchdown. Tony Nathan led the club in rushing with 76 yards on 16 attempts with one TD. The win kept the Cowboys a game behind the division-leading Philadelphia Eagles, who they defeated the following week, and they ended up topping the NFC East with a 12-4 record. They overwhelmed Tampa Bay in the Divisional round before being edged by the 49ers in the NFC Championship game. Miami went 6-2 the rest of the way to finish first in the AFC East at 11-4-1. They lost an epic Divisional playoff game to San Diego in overtime. Danny White ranked second in NFC passing (87.5 rating) and yards per attempt (7.9) while throwing for 3098 yards and 22 touchdowns. Tony Dorsett was second in NFL rushing (1646 yards) and was a first-team All-NFL and Pro Bowl selection. Everson Walls intercepted a league-high 11 passes, also garnering Pro Bowl honors, and Dennis Thurman was close behind with 9. David Woodley’s 408 passing yards against the Cowboys remained his career high (by far). He threw for 2470 yards and 12 TDs, against 13 interceptions, in what was his most productive year as a NFL quarterback. Likewise, the 164 receiving yards remained Jimmy Cefalo’s career best (and his only hundred-yard performance). He had 29 catches in ’81 for 631 yards (21.8 avg.) and three touchdowns. A showdown between two undefeated NFL Western Conference teams, the San Francisco 49ers (3-0-1) and Detroit Lions (3-0), occurred in San Francisco on October 24, 1954. The 49ers, coached by Buck Shaw, had an outstanding backfield with HB Hugh McElhenny (pictured at right) providing breakaway speed and FB Joe Perry and HB John Henry Johnson formidable power. End Billy Wilson was a fine receiver although QB Y.A. Tittle was playing with a broken left hand. Detroit had won the last two NFL Championships and was still a powerful club that won its last two games by a combined score of 56-3. Head Coach Buddy Parker’s offense was directed by fiery QB Bobby Layne and contained a good group of runners operating behind an excellent line as well as capable receivers. The defense was solid, particularly with big middle guard Les Bingaman, LB Joe Schmidt, and a defensive backfield led by safety Jack Christiansen and thus dubbed “Chris’ Crew”. An overthrow crowd of 61,000 fans was in attendance at Kezar Stadium. The 49ers had the game’s first possession and struck quickly. Joe Perry ran for 10 yards and then Hugh McElhenny broke away for a 60-yard touchdown run. Gordie Soltau added the extra point to give San Francisco the early 7-0 advantage. The Lions turned the ball over on the third play of their ensuing series when Bobby Layne fumbled the snap and DE Jack Brumfield recovered at the Detroit 33. Y.A. Tittle missed on two passes but a defensive holding call on third down kept the 49ers alive. Tittle threw to Billy Wilson for 11 yards and Perry rumbled for five before the drive stalled and Soltau kicked a 20-yard field goal. Down by 10 points, the Lions couldn’t move on offense and had to punt. McElhenny ran for nine yards and Tittle then threw a play option pass to John Henry Johnson that picked up 34 yards to the Detroit 24. The six-play, 67-yard advance ended with Johnson running 12 yards for a TD and Soltau’s point after had the home team leading by 17-0. Detroit put together an 80-yard drive that took 19 plays and stretched into the second quarter. HB Bob Hoernschemeyer converted a third-and-four situation with an eight-yard run and FB Lew Carpenter gained four yards on a fourth-and-two play at the San Francisco 20 and five yards when facing third-and-four at the ten. Layne completed six passes, the last to end Jim Doran for a seven-yard touchdown. Doak Walker converted and the score was narrowed to 17-7. On the first play following the kickoff, the Lions got the ball back when McElhenny fumbled and DE Jim Cain recovered at the San Francisco 36. However, the visitors lost ground and came up empty when Jim Martin’s long field goal attempt fell short. The 49ers had to punt after a short series and Detroit again turned the ball over when Hoernschemeyer fumbled after catching a short pass and safety Johnny Williams recovered at the Detroit 28. 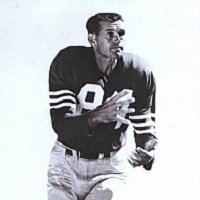 Tittle immediately threw to end Bill Jessup for 17 yards and the four-play series concluded with a Tittle pass to Wilson (pictured below) for an eight-yard TD. Soltau converted and once again the 49ers had a 17-point lead at 24-7. Carpenter took off on a 20-yard run to spark the next drive for the Lions and Layne threw to end Dorne Dibble for 23 yards to the San Francisco 41. A pass to Walker and a run by Hoernschemeyer picked up 11 yards in all but Brumfield and DT Leo Nomellini dumped Layne for a 10-yard loss and, after two long passes fell incomplete, Martin again missed a long try for a field goal. The Niners immediately advanced into Detroit territory on first down when Johnson took a pitchout and ran for 31 yards to get just past midfield. Perry blasted up the middle for 14 yards, but penalties blunted the promising drive and it was Soltau’s turn to miss a long try for three points. With time running short in the first half, Layne took to the air and completed successive passes to end Jug Girard for 15 yards, FB Bill Bowman for 11, and Girard again for 26 to the San Francisco 28. Walker kicked a 36-yard field goal and the score was 24-10 at halftime. The teams traded punts to start the third quarter before the Lions drove 76 yards in 10 plays. The big play came after a penalty and sack put the visitors in a second-and-33 hole at the Detroit 13 as Layne tossed a pass over the middle to Walker that gained 55 yards to the San Francisco 32. Layne was sacked by DT Bob Toneff, which not only resulted in a loss of eight yards but knocked the quarterback out of the game. Backup QB Tom Dublinski came in and threw a screen pass to Hoernschemeyer for 15 yards and the halfback followed up with a 12-yard carry on third-and-three. Two more passes by Dublinski were incomplete and a third down toss to Carpenter came up a foot short of a first down. Going for it on fourth down, Dublinski connected with Doran in the end zone for a three-yard touchdown and, with Walker’s conversion, the Lions were only seven points behind at 24-17. McElhenny gave the 49ers good starting field position at the 50 thanks to a 41-yard kickoff return and Johnson followed up with runs of 13 and 9 yards as San Francisco moved methodically down the field. Tittle completed successive nine-yard passes to McElhenny and Perry and Johnson concluded the 13-play series with a one-yard TD. Soltau again added the extra point to extend the Niners’ lead to 31-17. The Lions were driving as the period came to an end thanks to a Dublinski screen pass to Bowman for 28 yards and a run by Carpenter for 10. However, the series stalled at the San Francisco 25 and Dublinski’s fourth-and-six pass was incomplete. The 49ers took just three plays to move 75 yards to another score. McElhenny ran for 34 yards on first down, Perry gained six more up the middle, and then Tittle fired long to Wilson, who raced past Jack Christiansen on the way to a 37-yard touchdown. Soltau’s extra point kick hit the crossbar and was no good, but the home team held a 20-point lead at 37-17. Detroit responded quickly following Girard’s 34-yard kickoff return. Dublinski threw to Walker for 24 yards and then to Dibble for 27 down to the San Francisco two. From there, Hoernschemeyer ran the remaining distance for a TD and Walker’s PAT narrowed the margin to 37-24 with over twelve minutes still to play. A three-and-out series forced the 49ers to punt and the Lions put together a 77-yard drive in 12 plays. Dublinski completed seven passes, the longest to Dibble for 19 yards. Another throw to Carpenter was good for seven yard in a fourth-and-inches situation at the San Francisco 19 and it was Walker gathering in a pass from Dublinski for a 12-yard touchdown. Walker converted to make it a six-point game. The 49ers advanced to midfield before having to punt. Christiansen returned the kick 47 yards to the San Francisco 47, but an incomplete pass was followed by Dublinski being sacked by Brumfield for a loss of 14 yards. Another pass was knocked down and the visitors punted. They never got the ball back as Johnson ran for five yards on a third-and-three play and McElhenny gained 16 yards for another first down. San Francisco held on to win by a final score of 37-31. Detroit had the edge in total yards (443 to 424) and first downs (27 to 23). The 49ers were especially effective at running the ball, gaining 270 yards. They also recorded four sacks to none by the Lions. Detroit turned the ball over twice and San Francisco once. Hugh McElhenny gained 126 yards on just seven carries and had the one long touchdown. John Henry Johnson contributed 83 yards on 11 attempts, along with three pass receptions for 45 yards, and Joe Perry gained 51 yards on 15 rushes. Y.A. Tittle completed 13 of 25 passes for 157 yards with two touchdowns and none intercepted. Billy Wilson had four catches for 74 yards and both of the aerial TDs. For the Lions, Bobby Layne was successful on 17 of 29 throws for 212 yards and a TD with none picked off before having to leave the game. In his place, Tom Dublinski was 14 of 24 for 177 yards and tossed two touchdowns while also giving up no interceptions. 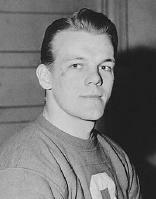 Lew Carpenter rushed for 56 yards on 11 carries. Doak Walker (pictured at right) was most effective as a receiver out of the backfield, gaining 129 yards on seven receptions that also included a score. Dorne Dibble gained 91 yards on his three catches. While the win pulled the 49ers ahead of the Lions, they lost their next three games to fall back into the pack in the Western Conference and ended up in third place with a 7-4-1 record. Meanwhile, Detroit bounced back to reel off five consecutive wins, including a 48-7 thrashing of San Francisco at home, and topped the conference for the third straight year at 9-2-1. There was no third straight NFL title, however, as the Lions were overwhelmed by the Cleveland Browns in the championship game. Part of San Francisco’s slump came due to the loss of Hugh McElhenny the next week to a shoulder separation, depriving the offense of his speed in the open field. He ended up rushing for 515 yards on just 64 carries for a staggering 8.0 average gain in six games. Joe Perry had a MVP season as he led the league with 1049 yards on 173 attempts (6.1 avg.) and scored eight touchdowns, and John Henry Johnson was runner-up with 681 yards on 129 carries (5.3 avg.) and nine TDs. Perry was a consensus first-team All-NFL selection, and both he and Johnson were chosen to the Pro Bowl. Bobby Layne came back to pass for 1818 yards and 14 touchdowns while Tom Dublinski started four contests and was successful on 77 of 138 passes (55.8 %) for 1073 yards and eight TDs, giving up seven interceptions. 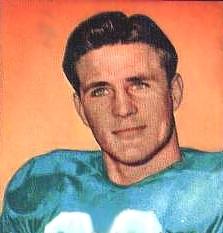 Doak Walker was a consensus first-team All-NFL and Pro Bowl choice, accumulating 1093 all-purpose yards. Pass receiving accounted for 564 yards of that total, on 32 catches (17.6 avg.). He was also the league’s second-ranked scorer with 106 points. A track as well as football star in college, Branch caught 36 passes for 665 yards (18.5 avg. ), rushed for 354 yards, and scored eight touchdowns on kickoff returns, which was a NCAA Division 1-A record. He was chosen by the Raiders in the fourth round of the 1972 NFL draft and, while Branch impressed with his speed, he was also still a raw talent and caught just 22 passes in his first two seasons as backup to WR Mike Siani. He beat out Siani for the starting job in 1974 and became the deep threat across from dependable possession WR Fred Biletnikoff. Raiders went 12-2 to finish first in the AFC West while leading the NFL in touchdowns (46) and scoring (355 points) and the AFC in total yards (4983). Won AFC Divisional playoff over Miami Dolphins (28-26). Lost AFC Championship to Pittsburgh Steelers (24-13). Branch’s breakout 1974 season was the first of three straight in which he was a consensus first-team All-NFL choice and four that resulted in selection to the Pro Bowl. He had career highs with 1111 yards and averaging 24.2 yards per catch on 46 receptions in 1976, when he again topped the league with 12 touchdowns. While the honors ceased coming after 1977, he had a long and productive career with the Raiders, playing until 1985 and catching 501 passes for 8685 yards (17.3 avg.) and 67 touchdowns. Branch added another 73 receptions for 1289 yards (17.7 avg.) and five TDs in 22 playoff games and was a member of three NFL Championship squads. Following his departure from the Raiders in 1985, he played for the Los Angeles Cobras of the Arena Football League in ‘88 and caught 25 passes for 250 yards and three TDs.